Vantablack is not a black paint, pigment or fabric, but is instead a functionalised ‘forest’ of millions upon millions of incredibly small tubes made of carbon, or carbon nanotubes. Each nanotube in the vantablack forest has a diameter of around 20 nanometres (that’s about 3,500 times smaller than the diameter of the average human hair), and are typically from around 14 microns to 50 microns long. A surface area of 1 cm2 would contain around 1,000 million nanotubes. Vantablack S-VIS is a variation of the original Vantablack coating that is deposited using a spray based process, and has been said to be the world’s blackest paint. Again, it is manufactured from carbon nanotubes, but unlike original Vantablack, they are very short, and once chemically bound together they form an open coral-like structure that is highly efficient at trapping EM energy. In parts of the electromagnetic spectrum Vantablack S-VIS is not as dark as the original Vantablack, but in the visible spectrum it is very difficult to know which is which when viewed side-by-side. At shallow grazing angles it can become even darker than the original. This feature makes it very suitable for complex 3D objects such as baffles and cold shields. Please note that Vantablack S-VIS is not available in a spray can or in solution for people to apply themselves as it requires complex post processing to achieve its high levels of absorption. Who can order Vantablack samples? In order to comply with UK export control regulations we are required to verify the identity and credentials of potential clients and the nature of their proposed use of Vantablack. Only verified companies, research facilities and educational establishments can order a sample of Vantablack. The coating is not available to private individuals at this time and we can’t accept orders from private email addresses. How can I get Vantablack Samples? Please visit this link to order samples online. Please note; due to export restrictions, samples cannot be supplied to private individuals. Also, we cannot accept requests from private email addresses like gmail and yahoo. Is Vantablack compatible with a standard tape pull test? Vantablack bonds really well to its substrate; in fact, it’s been independently tested for extremes of shock, vibration and thermal cycling, and it doesn’t come off or create foreign object debris (FOD) under these types of loads/shocks. This is because it differs from conventional paint type coatings (orders of magnitude lower density). This ultra-low density combined with Van der Waals bonding gives the coating its extreme shock and vibration resistance, but this also means that it can be removed by a tape pull test. To re-emphasise it does not come off or create FOD when subjected to real, extreme loads. This has been independently verified by National Research Labs (data on request). Can I order a sample for a school, university or museum? Yes, due to the high number of enquiries from museums and educational facilities we have created a sealed 'crinkled foil' display unit that demonstrates to viewers the unique properties of the coating. Unfortunately, if this is to be delivered outside of the UK you will need to fill in export license paperwork. This typically takes about 4 weeks to process. Can I be a distributor of Vantablack? Vantablack is applied using a complex and capital intensive process at our UK facility, and is not supplied as a bulk material for customers to apply (unless under licence for production applications). For this reason we normally work more closely with the clients in order to allow engagement within the design process. If you are seeking to act as a distributor then this would probably be unsuitable. If you were wanting to act as a manufacturer's representative then please send us more information about your company, and your track record in this field. Can I use the Vantablack name in my products? Vantablack is a globally registered trademark and recognised brand owned by Surrey NanoSystems Limited. Companies would need written permission from SNS to use the Vantablack name in their products. Light energy striking the Vantablack surface enters the space between the nanotubes and is rapidly absorbed as it ‘bounces’ from tube to tube and simply cannot escape as the tubes are so long in relation to their diameter and the space between them. The near total lack of reflectance creates an almost perfect black surface. To understand this effect, try to visualise walking through a forest in which the trees are around 3km tall instead of the usual 10 to 20 metres. It’s easy to imagine just how little light, if any, would reach you. Can I use Vantablack or Vantablack S-VIS in Art? Vantablack is generally not suitable for use in art due to the way in-which it's made. Vantablack S-VIS also requires specialist application to achieve its aesthetic effect. In addition, the coating's performance beyond the visible spectrum results in it being classified as a dual-use material that is subject to UK Export Control. We have therefore chosen to license Vantablack S-VIS exclusively to Kapoor Studios UK to explore its use in works of art. This exclusive licence limits the coating’s use in the field of art, but does not extend to any other sectors. What is Vantablack used for? Vantablack is designed to reduce unwanted stray light (from the ultraviolet, through visible and well into the infrared spectrum) for a diverse range of applications including high-performance infrared cameras, sensors, scientific instruments, satellite-borne calibration sources, and even to provide a unique aesthetic effect in certain high-end luxury products. Its ability to absorb light energy and convert it to heat is also of relevance in solar power development. What does Vantablack look like? In truth, it could be said that it is almost impossible to “see” Vantablack as so little light is reflected from the surface. However, the observer’s brain of course tries to make sense of what it is seeing, with the result that some people describe it like looking into a hole! The piece of aluminum foil shown here has been creased, or wrinkled, in a random fashion before being coated with Vantablack on one side. On the uncoated surface, the creases are clearly visible, yet on the coated area the surface appears as either a completely flat black surface or simply a void. The almost total lack of light reflected from the Vantablack surface pevents the eye detecting any surface detail. See our pictures gallery and social media channels for more examples. What does Vantablack feel like? People often tell us that they have an urge to touch a Vantablack surface when they see it for the first time. However, there are a few good reasons why this wouldn't be a good idea. First of all, a Vantablack surface is easily damaged by any direct impact or abrasion. Second, Vantablack consists mainly of free space, with the nanotubes offering little resistance to direct contact. The sensation would be akin to touching the underlying substrate. Vantablack is actually “grown” in a specially designed Chemical Vapour Deposition chamber under an array of powerful lamps that raise the surface temperature to 430ºC or higher to allow the nanotube forest to grow. So light itself is used in the production of the world’s darkest substance! A sprayable version of Vantablack is also available, called Vantablack S-VIS. Where can I buy Vantablack? 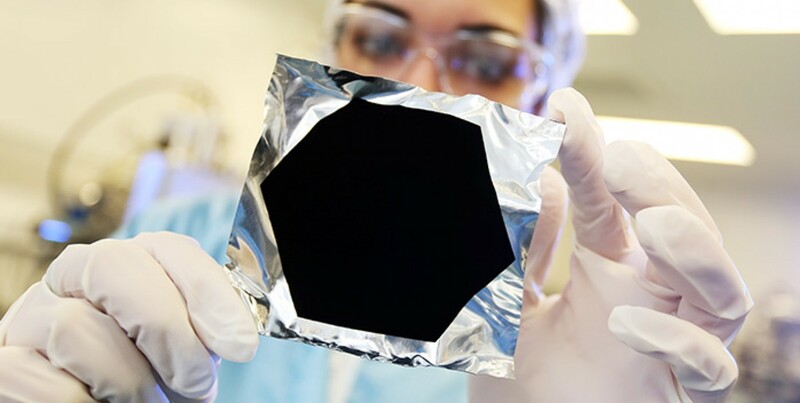 Surrey NanoSystems Ltd (SNS) is the only manufacturer of Vantablack coatings, and at this time all sales are handled directly by SNS in the United Kingdom. Under some circumstances Vantablack coated parts may require an export license from the UK Government. Can I apply Vantablack to my car? Though this would undoubtedly result in an amazing looking motor, unfortunately the limitations of Vantablack in respect of direct impact or abrasion would make this an impractical proposition for most people. It would also be incredibly expensive. Is Vantablack Fabric suitable for fashion clothing? Vantablack fabric is not suitable for use in fashion clothing or for applications where it contacts skin. The nanostructured composition of Vantablack results in a material that is extremely resilient in some respects, yet highly susceptible in other ways. Vantablack has been successfully qualified for the very high levels of shock and vibration experienced in a rocket launch. The material is able to withstand these extremes as it comprises many billions of individual nanotubes, each one of which has almost no mass. However, also as a result of its structure, it is highly susceptible to any direct impact or abrasion. The original version of Vantablack can generally be applied to materials with a melting point of around 550ºC or above, with negligible volatile constituents (please enquire about specific materials). The Vantablack S-VIS coating can be applied to a very wide range of materials. Yes, in suitable applications. The WHO’s International Agency on Research into Cancer (IARC), the group that lists and conducts research into carcinogenic materials, has categorised carbon nanotubes as “not classifiable as to their carcinogenicity to humans (group 3)”. See http://www.nanopartikel.info/en/news/1838-iarc-evaluate-the-carcinogenicity-of-carbon-nanotubes. This is the most up to date research from November 2014. As part of our ongoing commitment to safety we constantly monitor the latest scientific research and comply with all international safety standards. Powdered, lose or ‘free’ carbon nanotubes are known to be an irritant to the eyes, and the lungs if inhaled in sufficient quantities. See MSDS. For detailed usage guidelines and advice on handling nanomaterials please contact our technical department. Yes. The S-VIS variant uses a totally different manufacturing process that uses very short multiwall carbon nanotubes (typically <5 microns), with additional wet and dry functionalisations to create a chemically 'bound' coral-like open structure. We have not seen data that shows individual tubes can be released from the matrix, but as with all nanostructures, it should be used in appropriate applications.